Total cholesterol. This is the simplest and least expensive test. The test doesn't require any sophisticated lab work, either. The simple, do-it-yourself home cholesterol tests measure total cholesterol. But total cholesterol includes both "good" high-density lipoprotein (HDL) cholesterol, and the "bad" varieties, chiefly low-density lipoprotein (LDL) and very-low-density lipoprotein (VLDL). So if your total cholesterol is in the desirable category, it's possible that you may have unhealthy levels of HDL (too low) and LDL and VLDL (too high). Think of total cholesterol as a first glimpse, a peek. Doctors are not supposed to make any treatment decisions based on this number alone. Cholesterol levels can be lowered by stress (physical or psychological) or infection. An injury, cancer, stroke, or heart attack may have the same effect. So if your cholesterol levels are unusually high or low, your doctor will probably want to repeat the test some weeks later. Abnormal readings may also lead to tests for other medical problems. HDL cholesterol. HDL wins its laurels as the "good" cholesterol because it sponges up cholesterol from blood vessel walls and ferries it to the liver for disposal. In contrast, LDL deposits the harmful fat in vessel walls. An HDL level of 60 or above is associated with a lower risk of heart disease, and below 40 is associated with a higher risk. Moves cholesterol from arteries to the liver. Causes build-up of plaque inside arteries. LDL cholesterol. The LDL measurement is usually considered the most important for assessing risk and deciding on treatment. The definition of a healthy level keeps on getting lower. For people at low risk of heart disease, an LDL of less than 100 is desirable, However, people at higher risk of heart disease, an LDL of less than 70 or perhaps even lower is considered "optimal." Some experts say that an LDL of less than 70 would be a healthy LDL goal for all of us. 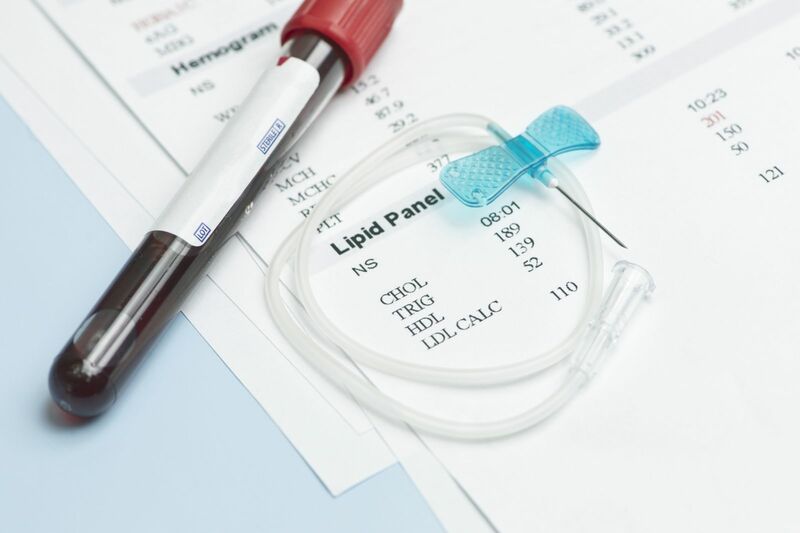 Your LDL is computed by plugging the measurements for total cholesterol, HDL, and triglycerides into a: LDL = Total cholesterol – HDL – (Triglycerides ÷ 5). LDL can also be measured directly in a non-fasting blood sample. You have to fast for about 10 hours before the test because triglyceride levels can shoot up 20%–30% after a meal, which would throw off the equation. Alcohol also causes a triglyceride surge, so you shouldn't drink alcohol for 24 hours before a fasting cholesterol test. C-reactive protein (CRP) is a protein in the blood that increases with inflammation. Because atherosclerosis is fundamentally an inflammatory process, many experts believe that CRP testing could lead to early detection and therefore save lives. The American Heart Association says CRP tests are most helpful for people at intermediate risk for heart disease, but not those at the low and high ends of the risk spectrum. You should get a fasting cholesterol test at least once every five years for everyone beginning at age 20. A fasting cholesterol test gives you the important numbers: total, LDL, and HDL cholesterol, as well as triglyceride levels. For more information, read "11 foods that lower cholesterol." For more important information on various conditions that affect the heart, along with their causes, symptoms, diagnosis, and prevention, buy the Harvard Special Health Report Diseases of the Heart.